Wad-Mart might be struggling now, but it still has a good chance of reversing its stock's decline if these factors work to its advantage. The biggest news this year for Wal-Mart (NYSE:WMT) has been its decision to raise the minimum wage paid to its employees to $9 an hour, and then increase it again to at least $10 an hour in 2016. It also "raised the floor and ceiling on pay bands" for employees who are above entry-level, meaning some 500 million Wal-Mart workers got a raise this year. The world's largest retailer also added more cashiers to speed customer checkout and is putting some 8,000 department managers on the floor as part of its $1 billion effort to enhance the consumer experience. Wal-Mart's Neighborhood Markets smaller-footprint stores have been a resounding success so far. In the first quarter, in which companywide comparable-store sales grew 1.1%, just meeting the low end of management's 1% to 2% guidance range -- but falling short of Wall Street's forecast for 1.4% growth -- the Neighborhood Markets chain recorded 7.9% comps growth. Same-store sales, or comps, are an important retail metric because they strip out growth a company records from opening more stores or from discontinued operations. Wal-Mart is opening these 42,000-square-foot stores at a faster clip than it is its Supercenters, which average about 180,000 square feet (there's also a tinier 12,000-square-foot version, too). In the first quarter, Wal-Mart opened 24 small-format stores versus 20 Supercenters, which increased its retail square footage by 3.2%. The omnichannel strategy Wal-Mart is pursuing to compete more effectively against the inroads by Amazon.com (NASDAQ:AMZN) is also proving successful. Although like the wage investments that sapped some of its financial strength in the quarter, each taking $0.02 per share from earnings, it's another initiative that ought to pay long-term dividends. Not that it's not paying off now. Global e-commerce sales grew 17% this past quarter, contributing approximately 20 basis points to the overall comps performance, and were a good part of the reason why U.S. comps were positive to start. Wal-Mart so also adding more distribution centers, including one in Brazil that will be dedicated solely to e-commerce (that will be the second one it has there). In addition, it is opening two mechanized fulfillment centers in the U.S., with two more planned for later this year. 3. Sam's Club recovers faster than expected. I've previously likened warehouse membership club Sam's Club as an ocean liner trying to make a U-turn, which means it needs more time and space to make a recovery than a smaller vessel performing the same maneuver. It's an anchor right now, but warehouse membership club Sam's Club could be an important driver of future growth. Photo: Mike Mozart, Flickr. That's evident in the division's quarterly performance, in which net sales dropped 3% as falling gas prices hurt results. Remove fuel from the equation, though, and Sam's Club's sales were up 1.5% year over year. But that doesn't mean it's really doing all that much better, as operating profit decreased 2.4% in the quarter. Whether any of this works remains to be seen, but if it sparks a response in consumers, Sam's Club might make that U-turn sooner than anticipated. After reaching an all-time high of $90 a share in January, Wal-Mart stock has lost 20% of its value as investors worry about the effects a weakening economy could have on the company's future performance. Sluggish sales have underscored their concerns, but the retailer appears to be making the right moves with an eye on the future to meet consumer expectations. 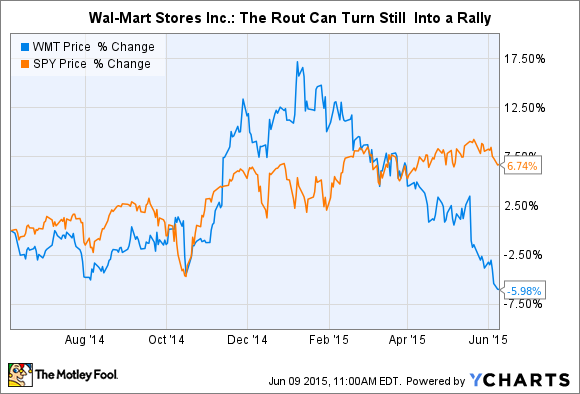 That is more important to its long-term viability, and could be the key to Wal-Mart's stock going up in value.